If you're planning on a family vacation with your kids, look no further than Singapore. The one stop tourist destination in Asia has everything you need to make an unforgettable family vacation that will surely bring joy to your family. Aside from the best hotels, restaurants, and shopping in Asia, Singapore has a number of top notch theme and amusement parks that are specifically made for the entire family to enjoy. A definite winner in any book, the Night Safari is one of the most visited tourist attractions in Singapore. This multi-awarded attraction receives an average of 1 million visitors per year, making it a top destination for both locals and tourists. This 40-hectare land of secondary rainforest is filled with more than a thousand animals, with 30% of them threatened species. You can walk the well lit trails or ride the tram around the safari, where you can see tigers, rhinoceros, tarsiers, and other exotic animals from all over the world. The world's first nocturnal zoo also offers cultural performances, tribal dances, and other events that will definitely make your night exciting. Every kid loves dolphins. You and your kids can swim with the pink dolphins, sharks, feed stingrays, watch a sea lion show, and even have a fish reflexology. The Underwater World Sentosa hosts over 2,000 marine animals, making it a truly remarkable educational and jaw-dropping experience you and your kids will never forget. One of the highlights is the Water-T tank, where you can feed fishes through side openings of this gravity-defying aquarium. 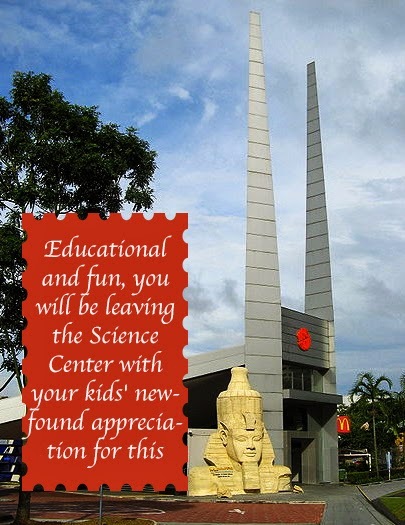 If you want your kids to learn while they're having fun, take them to the Science Center Singapore. With over a thousand hands-on and interactive activities, you will spend hours inside the 20,000 square meter space consisting of 14 indoor and outdoor galleries. One of its highlights is the OMNI Theatre , where you get to watch IMAX movies to your delight. Educational and fun, you will be leaving the Science Center with your kids' newfound appreciation for this subject in school. If you come from a country with no snow, then visiting Snow City is a must. Opened in 2000 and revamped in 2007, Snow City has an average of 250,000 visitors each year. Experience sub zero temperatures all year round inside the snow tube, a three-storey and 60 meter long space where you can ski and snowboard. There are skiing and snowboarding classes, which makes for a great family activity. There's also an ice sculpture gallery, igloos, and you can even have a snowball fight - it will definitely be an experience you will never forget. After a few hours of enjoying the snow, take the chill away with a cup of joe at the hot chocolate bar. The first ever Universal Studios in Asia, it is a definite place that your family must experience. Enjoy rides and activities based on your favorite blockbuster movies. Kids will surely enjoy the Transformer Ride and the Jurassic Park Rapid Adventure. Eight of the 24 attractions were made specifically for Singapore, giving you a truly unique experience of adventure. Traveling with kids in a foreign country is very fulfilling especially when you see them scream with joy and delight. However, getting around can be a hassle. Public transportation in Singapore is world-class, but you wouldn't want to carry your child on your back while waiting for a taxi or getting in line for a train. Most definitely you will be buying souvenirs from the places you will be visiting, so why not get a Singapore car rental to help you solve your problems. After a day at Universal Studios, for sure your kids will be beat. Let them sleep in the car while you drive back to your hotel, and then take your wife to a romantic dinner after. Only a car rental will give you the convenience of traveling from one place to another at your own time, pace, and convenience. Johnny Lai is the owner of Exclusive Limo and Car Rentals - Singapore's premier car rental service that always puts its customers first - giving quality service and the best quality cars. Great places to see in Singapore. The first 2 will be my top priority. Bonding with animals, I like that. I miss Singapore and I don't mind going back. We might next year and hopefully, a longer one too. Our last trip to Singapore was a hit! My husband took the kids to the places he himself visited when he was a kid (he's half-sing) and hopefully we get to go back and visit the newer parks! Thanks for sharing! This is truly amazing, will definitely keep your suggestions in mind, if ever we will visit Singapore in the future at least we have places to look forward. I will definitely go to the night safari! Love to see new animals! I will remember this. Maybe by the time I visit Singapore my nephews who live there already prepare an itinerary for me. When I went to Singapore, wala pang Universal Studios. I'm not sure when I can come back to the clean city but I will make sure I can get a chance to visit Univ Studio soon.